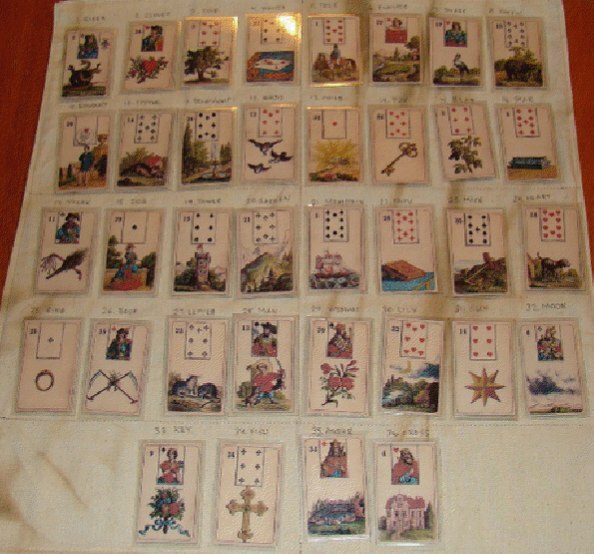 Okay, so one thing that helps a Grand Tableau reading flow like a breeze is to know the numbers of the 36 Lenormand cards by heart. This is one thing I never could quite remember fully. So I "battened down the hatches," fastened my seatbelt, and applied some memory strategies I learned from the classic book called The Memory Book (GREAT book for cramming information!). When I sat down to develop a memory system for remembering the cards, I hoped to have them memorized in 2-3 weeks. What happened? I had them memorized in a little more than an hour. You can, too! And here's a perk: once you know the numbers of the cards, you'll never need a spreadcloth again for a Grand Tableau reading. The numbers will aways be in your head! I've created a series of a few videos to help you remember which Lenormand cards are which number, and yes, you'll be able to do it backwards, too! You'll not only be able to name the card titles forward and backwards, but you'll be able to name any number from 1-36, and you'll know which Lenormand card it is, right off the top of your head. Set aside a little time for concentration, and here are some short lessons to help you remember. All the card Titles & Numbers are listed at the bottom of this blog for you to reference for your own flash cards. Let me know if this works for you, and I'd like to hear if you thought of any of your own memory triggers that may be different than mine.